Indian Vanity Case: Bio Oil ~ Does It Really Work For Stretch Marks & Scars? Bio Oil ~ Does It Really Work For Stretch Marks & Scars? Since last year, I've received a ton of questions regarding stretch marks, so I thought I'd do a post on it. Stretch marks are the #1 skin concern during pregnancy (More than weight gain even, at least for me. And yes, I still can't fit into most of my old clothes! More on that in another post. ), because they are, in most cases, invincible (Unlike some political parties who lost the state elections today.) Once they've marked their territory on your body, they become a permanent reminder that prevention really is better than cure. I have a vivid memory of a person I know always scratching herself when she was pregnant. The scratch marks on her stomach and - I won't write the b-word - chest area were red & bloody! I asked her why, because I didn't know about these things called 'Stretch Marks' back then. She had this relaxed smile on her face, and said, "It's sooo satisfying to scratch until my skin bleeds." Ya, it's quite psycho. But I've been there - with mosquito bites. I used only Bio Oil all through my pregnancy, and I'd been using it on old stretch marks and scars for years before. I won't bore you by making you read a lot, and get right to the point(s)! First thing, I got no stretch marks on my tummy after pregnancy. Zero. Thank Goodness Bio Oil! When did I start to apply? I found out I was pregnant in February '14, and I started using it religiously after showers around the last couple of weeks in March. So, there wasn't much itching, and I didn't feel my skin stretching & losing its elasticity during those 9 months. I think you can start with any other dry skin lotion in the beginning. You're good as long as you keep your skin moisturized. How much to apply, where, when? All around my tummy, yes, but I also applied it on my lower back, hips and derriere. Basically, where you're most likely to expand during pregnancy. I apply after showers, and sometimes before bedtime. Generously. How many bottles I used during the Pregnancy? As you can see, I'd been using five 60ml bottles. There was a 6th older bottle that I'd discarded. Does Bio Oil remove old stretch marks? Not completely even after years. I have a few, and with time, Bio Oil has made them less noticeable and less "wormy" looking. I'd say it flattened them. Stretch marks during the early stage are red, and they turn white as they become more permanent. Get them while they're young! Does Bio Oil remove scars? Again, it helps flatten and lighten some scars. Like keloids. I got my belly button pierced - twice! My body rejected it both times. Now the scar is half the regret it used to be because of my committed relationship with Bio Oil. Did I mention this post is not sponsored by Bio Oil? Even though I kinda wish it was. Maybe, a lifetime supply? Price of Bio Oil in India: Rs.450 for 60ml. I think that's all. I hope I've answered the questions you asked and had in mind. If you have any other that I forgot to mention, feel free to ask! Good Luck to all the lades who are expecting....shoo stretch marks! I have been reading a lot about Bio oil since I have started researching about ways to reduce acne scars. I watched one girls video where she claims that she applies bio-oil to her face every night to get rid of the brown acne scarring. I am very sceptical about applying oil on my face since I have a acne prone skin. Have you ever tried using it on your face and noticed any difference? I have read mixed reviews about bio oil but now as going by your experience.. I am going to get it next and start using on my acne marks at the back and lower back stretch marks.. I had tried on my acne marks but it broke me out.. I stopped & using again still broke me out. Even i have been using bio oil religiously in my pregnancy... and touch wood till 8th month, i have zero stretch marks..!! I feel for women who are newly pregnant and scared of stretch marks. I was getting stretch marks eight weeks into pregnancy with my first daughter, by the time she was due they were BLOOD red. 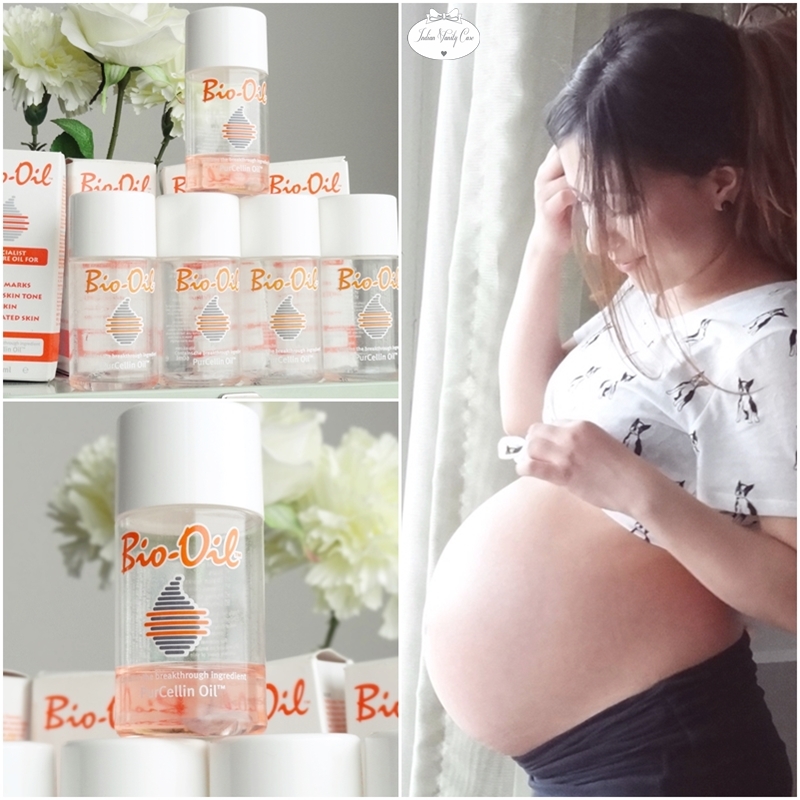 I was using bio oil all the time from 10 weeks of pregnancy but it didn't help me. For years and years and years I hated my stretch marks. I felt so ugly with them. I didn't get many new ones with my second daughter. But it's been 11 years since I was pregnant with my first daughter and to be honest, I couldn't give a s--- about my stretch marks now in all honesty. i don't even remember they're there. I'm glad that I was still in my midtwenties by the time I realised that stretch marks actually aren't that big of deal. But I dislike that I let them bother me up till then. Tthey're only stretch marks. Most people have them whether they've given birth or now. I know plently of slender ladies who haven't had any babies but have stretch marks on the small of their backs or on their calves. Thanks for the post CZ! I want to know how do we know if we are getting a stretch mark ?!? Very useful post. I trust your reviews /feedback .